By utilizing creative and innovative circuitry, a quantum leap in sound quality has been obtained at an extremely low cost. So what is this "grounded grid" thing? Its a way of driving a tube that was pioneered many years ago in radio design. Its primary characteristics are very wide bandwidth and low noise. "So how does it sound?" The unit is blistering fast. The response is flat to 300 kHz. The high speed reveals every subtle nuance of the music. It doesn't "mask over" and "white wash" the music so that everything sounds the same and puts you to sleep. The preamp is dead quiet. Really dead quiet. No hum, no hiss, nothing. The result is a very musical, natural sound that is the complete absence of coloration. It's accurate and natural without being the least bit analytical. Ask someone who owns one. The power supply and audio circuits are located on two separate circuit boards providing optimal isolation for reduced noise. Three individual power transformers are used to eliminate interference. The front panel is acid etched for a very handsome, durable appearance. The lid is an attractive brushed stainless steel which will never tarnish. This is a real high-end package in both design and construction--without the big price. Here is a muting circuit that provides about a 15 second mute delay during turn-on for the Grounded Grid Preamp or any audio device that has 12 volts DC available. 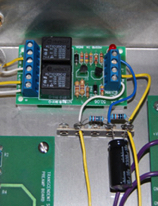 The circuit draws only 60 mA at 12 VDC allowing it to be installed in most any component. The circuit board is prewired. All that is required is to mount the board and terminal strip with three components and wire it up. The device does not interfere with the audio signal at all. Upon shut down, the mute function operates immediately thereby preventing any transients as circuits power down. Harmonic Distortion: Less than .02% at 2 volts RMS out. Signal to Noise Ratio: Greater than 93 dB. Bandwidth: 1 dB down from 5 Hz to 300 kHz. Max Signal Out: 20 volts RMS. Input Impedance: 50 k Ohms.